Black Beauty® Fall Magic™ has been custom mixed for successful fall seeding. This mixture is great to use on established lawns or to start new lawns from scratch. Repairs summer damage and provides an attractive, thicker, greener lawn. 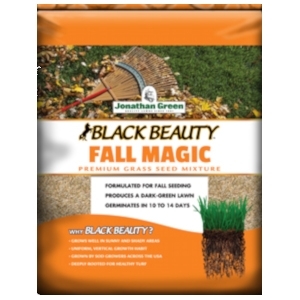 Use Black Beauty® Fall Magic™ in sun and shade lawn areas. The mix contains several grass types, including Black Beauty® tall fescues. Visit our Seeding Guide for complete directions.